About twenty-five years ago V bought me a yoghurt maker. I took to it straight away and used to make my own yoghurt all the time. I think I stopped when I got married and had to share my under-the-counter fridge with one and a half others (husband and ten-year-old stepson) and there just wasn't room in the fridge for the yoghurt tub. That was over twenty years ago. I noticed the kit in its box in a cupboard recently and decided that either I had to start making yoghurt again or it had to go. I now have a larger fridge, so why not? I've googled and found that you can't get these Deva Bridge yoghurt makers any more, which is a great pity. Apparently you now have to have electric kits with individual pots. This way is so much better. 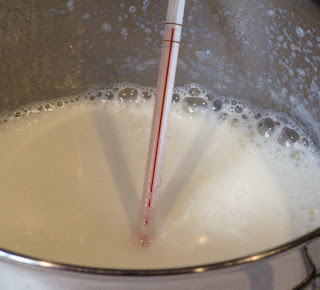 Gradually blend the milk into the yoghurt starter, stirring all the time. Put the two lids on the pot. Apparently the curve of the inner lid, together with the channel in the rim, collects some of the condensation, but I'm not sure this would be completely necessary.) Leave for five hours. It's a little difficult to photograph yoghurt but I think you can see the two curves on the spoon I stuck into the pot, which you wouldn't get with milk. Fresh yoghurt is deliciously sweet. The instructions say that the acid taste will start after about three days. I remember only the first day as being actually sweet, though. You can flavour and sweeten your home-made yoghurt, of course, though I plan to have it just as it is, on muesli as I usually do. There's good news and bad news. The bad news is that after 25 years of being careful, this morning I managed to catch the edge of the yoghurt thermometer with the dishcloth, sweep it to the ground where, of course, it broke. The situation is rescued, however. More good news is that the yoghurt is still just as sweet this morning. And finally, although the directions say to leave the yoghurt making for five hours, by this morning it was considerably thicker than yesterday. I'm still very sad at breaking the original thermometer, though. I like your article, since i'dd like to order one Deva Bridge Yoghurtmaker myself. i was wondering what kind of purpose the little white round thing has, the one with the big D on it? It is a tool you put in the boiling milk, to prevent cooking over. By the way, it is not necessary to boil and cool down the milk when you use UHT bricks. Just need the right temperature : 2min 30sec in microwave and stir with the starter yoghurt. Thank you so much for this post! I'd recently resurrected my Deva Bridge yogurt maker (and thermometer) from the back of the cupboard but had mislaid the instructions. I made stacks of delicious yogurt with this back in the 1970s and can now look forward to making much more down here in deepest Devon. this is just what I was looking for! I have returned from living overseas for 10 years and have been unpacking 10 years of stored boxes. 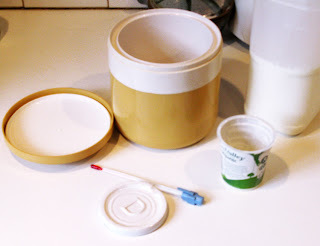 In one of the boxes I found my deva bridge yogurt maker and I remember the yoghurt was so sweet. Unfortunately there weren't any instructions or the thermometer. But you have rescued the situation - especially with the temperature required for setting - I have just bought myself a cooking thermometer - hope it will be okay. I' m using lactose free milk, it 's also working. But I use always more than a teaspoon : an eatspoon full, it's half of a little yoghurt tin. Only when its a heatwave it s not good. So I think you do the temperature wrong? When I make yogurt, I add about 1/4 to 1/3 cup of dry milk before heating the milk and it helps to thicken it, not so runny. Love the yogurt in my Deva Bridge. Before it, I had the electric one and it died. Had the Deva for years and it's still great! I still have my Deva Bridge Yoghurt maker and the additional cheese maker, it is one of the best things my mother in law ever gave me, the other was her Yorkshire (from Yorkshire! ), Yorkshire Pudding recipe which has never failed! I also have the original box for the two Deva Bridge items and all the instructions. I have been trying to search for/buy one for my nephew and his new wife, that is the only reason I found this blogspot! The company no longer exists sadly, but actually it is a glorified flask, and the open topped soup flasks will do the same yoghurt making job. The filter mesh for making the cheese fitted exactly on top of the yoghurt maker and made straining easy and not at all messy, very easy to clean! How can I help? Send you photos of the instructions ? 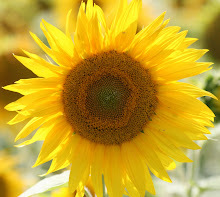 I don't know how to make 'secure' comments on blogs as I never have time to look at them or keep up with them!? I bought a Devabridge yoghurt pot 30 years ago and have made my own yoghurt ever since. I ran a B&B for 10 years and taught many guests how simple it was to make. For the correspondant who worried about the correct temperature - I only use my little finger as a temperature test. I place the boiled milk in its pan in a sink of cold water to cool rapidly. Stir a few times and after a two to three minutes hold your little finger in the milk for a few seconds and it should feel just warm. My experience is that you do not need a milk saver either as once the milk has been brought to the boil, turn down the heat until the milk is just bubbling and leave for 6 minutes. I bought my Deva in London in the 70's and recently resurrected it after moving from a big house. I too had lost the instructions so you are a life/yogurt saver! English milk is usually full cream and that probably has a significant effect on the final consistency. I can't remember what I might have done once I was in the US to deal with this. I have also been told that Stoneyfield brand makes the best 'starter". Just going out to buy some & get started! It is so good to read that the dear old Deva Bridge Yoghurt makers are still out there! My Mum bought one for me back in the early 80's after having great success with hers. I have always used Greek yoghurt as a starter and never had any problems. Mum's tip which I always follow is to fold a teatowel and place that on top of the outer lid to keep it extra warm while you are waiting for the yoghurt to develop. I leave mine for about ten hours before opening it and enjoying the contents. I have a surprise for you all! I have found the yoghurt maker from Deva Bridge AND the Deva Bridge SOFT CHEESE MAKER! I am about to experiment with them both! I will let you know how I get on! Great stuff! I've just resurrected my Deva Bridge Yoghourt Maker and used it fpr the first time since the 80s. It was just as good as ever. Why don't they make these brilliant things any more? Just found mine in the back of my cupboard and had placed it into a charity shop bag this morning. But I shall be keeping it and using it. It's still all in it's original box too. Thank you for this blog. Saved the day! Thanks for this information. I have dug mine out and have everything but the thermometer which I broke a life time ago. My instructions are so old they didn't specify the temperature requirements but you have rectified the situation. Great. These Devabridge yoghurt makers are still turning up at the back of kitchen cupboards. Rediscovered mine the other day and just refining my technique. Really is the best yoghurt! We bought a Deva Bridge yoghurt pot 30+ years ago in Liverpool. We moved to Canada in 1988. Happily the pot made the journey with us, but packed away in the basement several years after that. 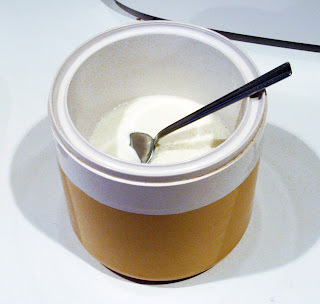 Rediscovered, dust covered, in our basement about 10 or 11 years ago, and making yoghurt almost daily since then. Great product, simple to use. Pity nothing like this is available any more. The ceramic disc is to put in the milk pan while you heat the milk. When it begins to rattle remove pan from heat. Set kitchen timer for 30 mins (you can use thermometer but I broke 2 and this time works just as well). Then when timer rings in the larger plastic container put your 2 teaspoon of starter yoghurt (must be a 'live' one available in any supermarket) and slowly add your heated milk stirring as you go. Put on white inner lid then outer one and leave on kitchen work top (I make mine day before needed). Once it has set it can live in the 'fridge. To make your next batch you can use 2 teaspoons from this batch and so on. You will need a fresh supermarket starter after a while when the set is not so good. AGI-DISK - The white ceramic disk, used while heating milk, is especially designed to rock or rattle as the milk begins to boil. (Hard rock or rattle indicates boiling. Soft or very gentle rocking or rattle indicates simmering.) Agitates the milk as if you were stirring and prevents milk from boiling over. This handy disk can be used with any liquid to prevent its boiling over -- place it in the pot and put your mind at ease. Does anyone know where I can get another inner white cap for my Deva Bridge it has gone missing? I came across this site while searching for info about the Deva Bridge Yogurt (US spelling :) ) maker. I too have one from many years ago and have decided to dust it off and start using it again. I have both the yogurt maker and the soft cheese maker - both with all their parts and instruction manuals! 1. SET-UP: Simply place the DEVA BRIDGE SOFT CHEESE MAKER onto a plate. Spoon unstirred yogurt into the strainer. Stand the strainer on the rim of the DEVA BRIDGE Yogurt Maker container. The legs are designed to fit securely into the indentation in the rim. 2. POUR: Any drips of yogurt from the plate back into the strainer then place the lid on the strainer. 3. STAND: Set aside for 4 to 8 hours or longer -- 4 hours for a very soft, creamy cheese; 8 hours for a slightly firmer, but still creamy variety. Most of the whey will drain off in the first 8 hours, though you can control the solidity of the cheese by the length of time you leave it to drip. If desired, leave up to 24 hours at room temperature. 4. REFRIGERATE: If you do not plan to use the cheese immediately, place it in a covered container in the refrigerator. It will keep well for a week or more. 5. CLEAN-UP: The soft cheese will come away from the strainer very easily. After emptying, rinse thoroughly with warm water and leave to air dry before storing (we do NOT recommend washing in a dishwasher). and which is really helpful to the yogurt lovers. Wow! Just recommended this post to someone and thought I'd take a look at 26 comments! So glad to have rekindled the interest in yoghurt making for at least a few interested people. The Deva Bridge Yoghurt Maker kit is available by sending $24.95, postpaid, to Chantry, 59 Baymont St., P.O. Box 3344, Clearwater, Fla . 33515. The Deva Bridge Soft Cheese Maker may be ordered for $11.95, postpaid. The yogurt maker and cheese maker m a y be purchased together for $28.95, postpaid. For more information, call (813) 446-1960. I am a potter, textile artist and bon viveur on a budget. Seen a large talkative woman dressed in purple? It could be me. Just a Card supports artists and shops selling artists' work. If everyone who went into an arts & crafts shop bought just a card it would help some shops stay open. The same goes for keeping artists in business.